This is one dessert that you can use to wow your guest. The look of the water chestnuts look spectacular and when served in fancy glasses, they really do look nice. A red dessert looks good if you’re wearing black. Accessorizing!!! Hahaha. Red rubies they may be, but not wearable. This is not my maiden attempt with the famous Thai dessert. I first tried making this a decade ago when I was staying with my chummies. They loved it, but I wasn’t all that successful cos the starch wasn’t sticking well to the water chestnuts. Then lately I read from the net that it’s spraying that makes the 2nd layer of starch adhere well and that’s how you make the starch really thick.I had some water chestnuts in the fridge, originally intended for a soup, but heck, what was I waiting for? Waiting for the day I could get jackfruit!!! Finally Saturday came, and I could get some from the local farmer’s market. This dessert will taste weird to me without jackfruit, cos it’s this sweet yellow flesh fruit that gives the dessert the super aroma. Actually, in Ipoh, one can easily get this from the main wet market. 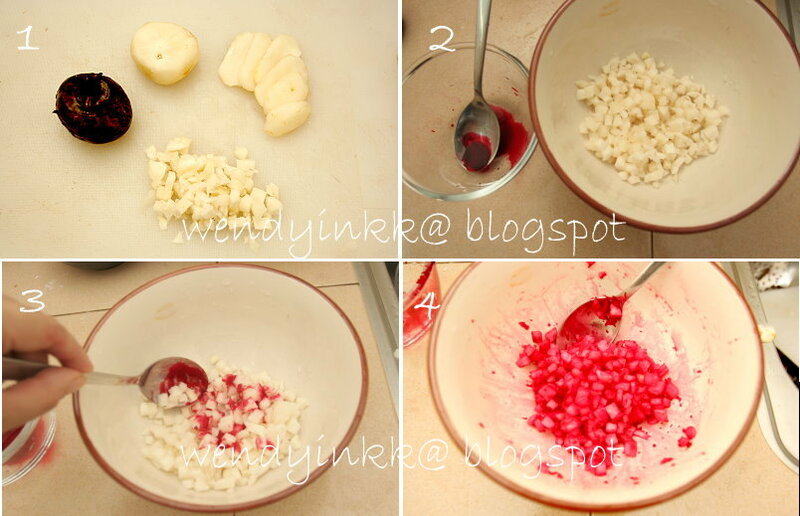 It’s called “pomegranate seeds, 石榴子” instead. And it doesn’t come cheap. More than 15 years ago, I knew it was RM3/pack, about 1 cup’s amount with water!!! So, why not make this yourself. The instructions I give may seem long, but once you get the hang of it, it’s really easy peasy. 1. To make syrup, bring B to a boil on medium heat, let it simmer for 2 minutes. Turn off the fire and let it cool down. 2. 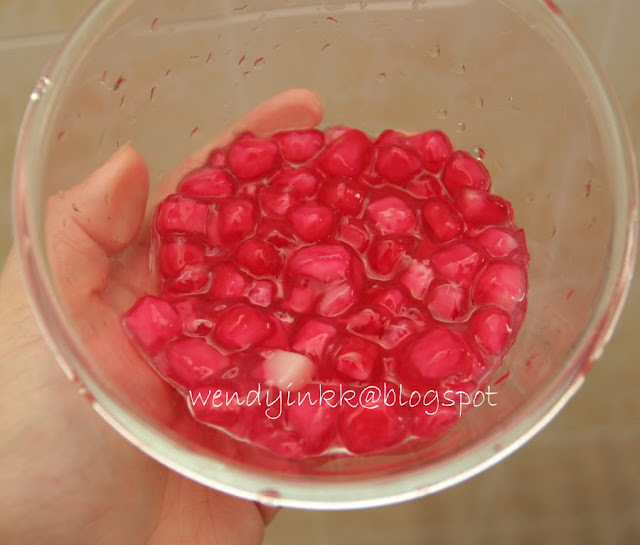 While waiting for the syrup to cool down, peel and cut the water chestnuts into 5mm cubes. 3. 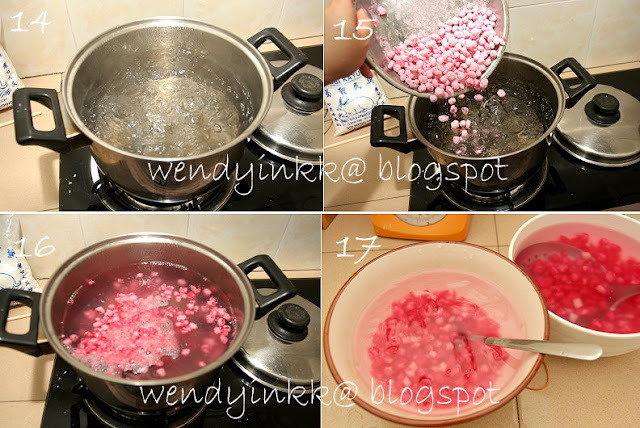 Mix food colouring with water and mix food colouring to the cut water chestnuts. 4. 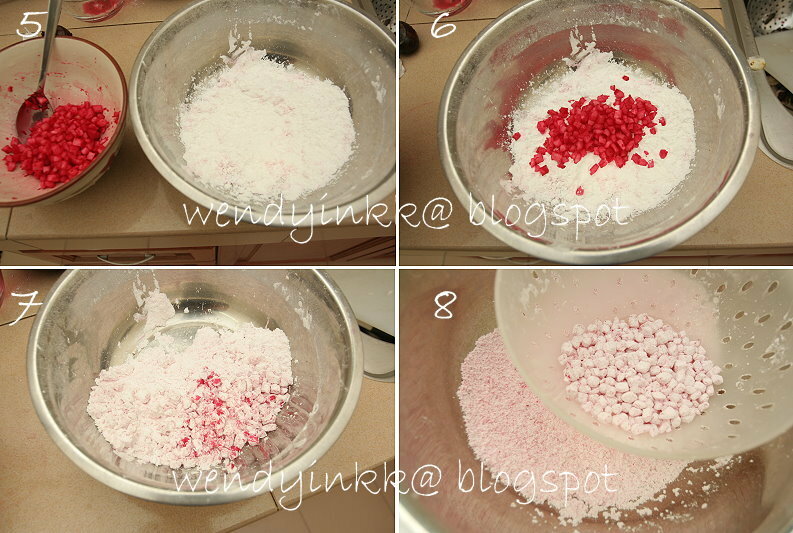 Put tapioca starch into a large bowl/basin. Pour all the dyed water chestnuts onto the starch. 5. Toss the basin/bowl so that the chestnuts will be evenly coated with the starch. Do not use a spoon to do this, but toss the whole basin. 6. Prepare a colander (not sieve) in another basin/plate. Pour all the water chestnuts and starch into colander and sift to separate extra starch from the coated water chestnuts. Remember to use the basin to collect extra starch. 7. Pour water chestnuts into a plate. Spread it out and lightly spray with water to moisten the water chestnuts. Toss and spray again. Repeat until you see the surface looks moistened but not wet. 8. Pour water chestnuts back into collected starch and toss and sift again. If you want a thicker layer of starch, repeat the spraying and tossing in flour again. 10. Meanwhile, prepare coconut smoothie. Pour half the ice, half the syrup and half the coconut milk into a blender, and whizz til fine. 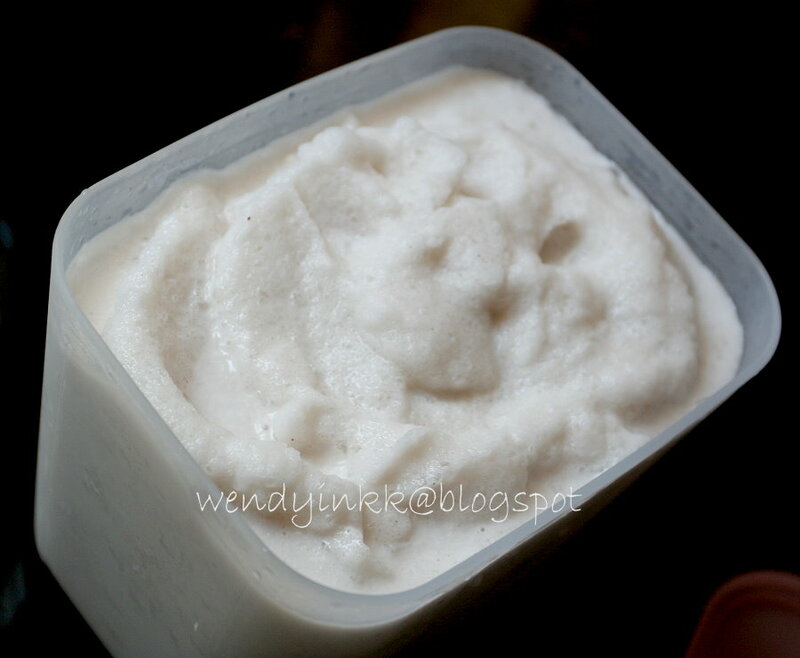 Pour coconut smoothie into a freezable container. Repeat whizzing with balance of ice, syrup and coconut milk. Put coconut smoothie into freezer while you do the rest. 11. Bring a pot of water to boil. Prepare a big bowl of ice water. 12. Pour in all the coated water chestnuts, stir gently immediately for a while so that the chestnuts will not clump together and let it boil on high heat for 1 minute. 13. Remove water chestnuts from boiling water by using a slotted skimmer and put into ice water immediately. 14. Let it sit in the ice water for 10 minutes or longer. *** Stirring gently once a while to break up the "rubies"
15. Meanwhile, slice the jack fruit. 16. 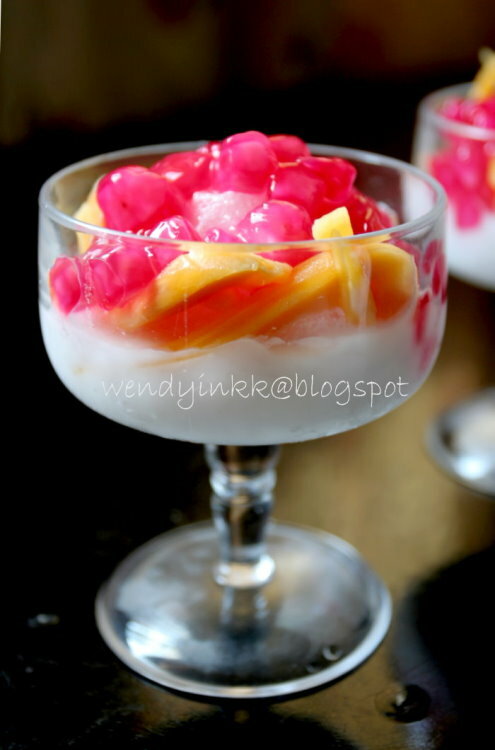 To serve, put some coconut smoothie into serving bowl, top with sliced jackfruit and "rubies". Serve immediately. ** I made this twice in a day. The first trial, by the time I wanted to boil the chestnuts, the gas ran out. So I called for gas and it arrived half an hour later. My 2nd batch, coated with starch 3 times were boiled immediately after the 3rd sifting. Comparatively, the 1st batch had a nicer starch coating, although it was only floured twice. Then I came to think of it, yeah, letting it sit for a while will make the moisture seep out and make the tapioca starch stick better to the water chestnut. *** I also found that by letting it sit longer in ice water, the starch expands to wrap the chestnut better. No wonder those sold in Ipoh looked so thick with starch. They were sold in water filled packs, like cendol. 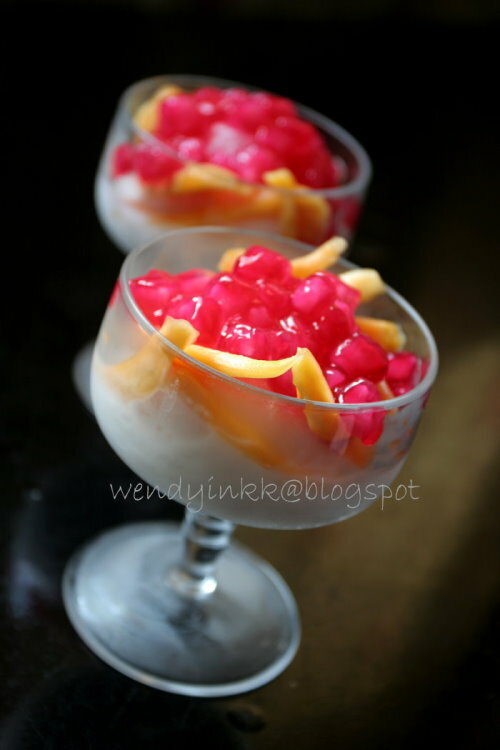 refreshing dessert! love the color combi! 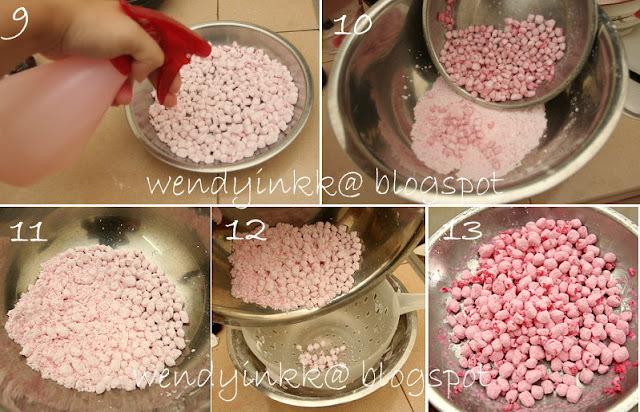 so pretty.. finally the recipe is up lol... saw it in msn so long ago leh..
Nice. Really like the idea of the coconut smoothie. It's not my idea. But the actual way of eating it is with shaved iced drenched with thick coconut milk. I don't have a shaver, so have to make do with a smoothie. Have you salute you Wendy! I think those stores selling "tong shui" have to close shop soon! With you around letting out the recipes of these yummy treats...it's no wonder there are more good cooks around, heehee! Looks like a lot of steps but I love this red rubies. I always get angry when those stores don't add them or didn't have water chestnuts in their corn starch balls. :P Thanks for the recipe!! This dessert is so pretty that I would rather admire it than eat it! Wonderful sharing! 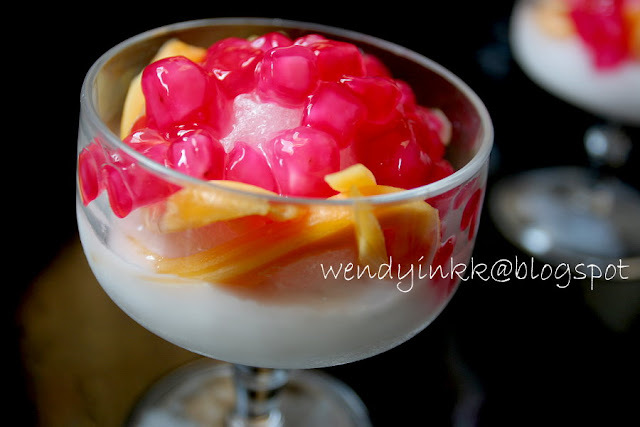 This is one the dessert i would ordered whenever i take meal at Thai restaurant, look like i can prepare this at home next time.Thanks for sharing. Looks so good. Love the color. Thanks for sharing. This is so so so yummy! It's my favorite! I like the coclour combination, is lovely! Thanks for sharing. Yummy, I really admire your patient and skill in making this dessert, it seems complicated to me...next time I will try order this in Thai restaurant. 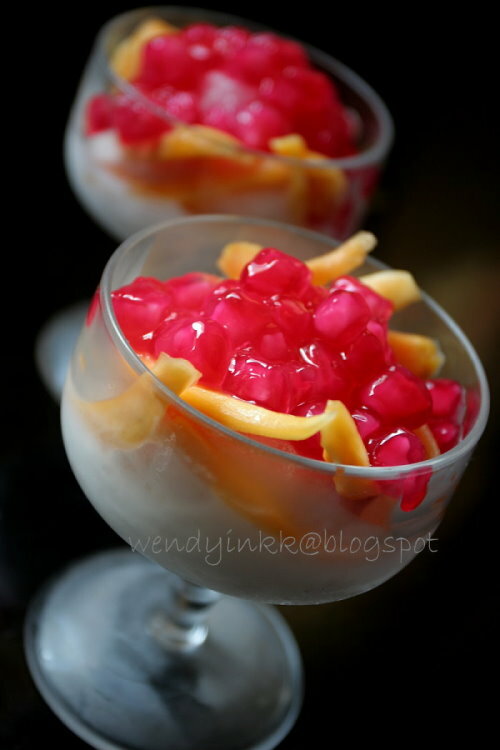 This is a must order dessert for me if I dine at Thai restaurant. I tried making it once many years ago but never attempt it again. What a great idea making the coconut milk into smoothies. Thanks for the tips of how to make the perfect red rubies. I dunno abt those dessert stalls in Spore, but here, it's only found in Thai restaurants. Eat, don't jusy admire. Look too long and it will melt. It's not difficult la. It's quite easy. Try making this, but you need a few to help eat it. Make some soon, but with canned coconut milk it might taste different. Beautiful and perfect! I love it! Wow... my favourite dessert! Yours look so nice...! Ha ha ha, I love to cook this dessert! My daughter's favourite! Oh my goodness, I love this yum...yum. ;p Thanks for sharing. I have to lay my hands on this. Pretty dessert!! Love the red and yellow combination, I'm sure it tastes as great as it looks! kup koon kaa for your tub tim grub! i didnt know that they have water chestnuts in them or supposed to have water chestnuts in them..those are really sparkling rubies! Those crunchy stuff inside are water chestnuts. It's different from those chewies that we add into Bubur chacha. Love this dessert very much, ...recently tried some in Bangkok but I find they are not as good as those we have locally lol! Maybe I am biased but that's my opinion. Your red ruby so pretty! I made once, the tapioca starch not really stick to the chesnut. I like your method of making the coconut smoothie...those sold here is just sweetened coconut milk with ice added. Lovely jewels in pretty bowls! Apasal nak tunggu tahun depan? OMGGGGG..I never knew TabTimKrap was made of water chestnuts!!!!! YAY!!! I love this dessert so much! I'll def be making this. Haha, it is and it's easy to make. There's an easier way to make the starch nice and thick. Put your tapioca starch into a big ziploc bag (I use 20cm ones), together with your water chestnuts, and a little of the red liquid that the water chestnuts have been sitting in. Toss everything in the ziploc bag, breaking up any chestnut clumps while you're tossing it. Keep tossing until it reaches the size you want. (Takes about 2 minutes of vigorous tossing). When you're done, empty the contents into a colander to 'sieve' away any excess flour. Saw this method at some other blog, and found it to be by far the single easiest way to make beautiful rubies. The ziplock bag is just the same as the basin. I believe you are using canned waterchestnuts, and that is moister (due to sitting in the can with water) and can be coated without the additional spraying. Good morning Wendy, thanks for sharing this, I have tried it for AFF this month. Especially love the coconut smoothie method as it ensured the dessert doesn't get diluted, yums! !